KATHMANDU, July 17: The proposal to carve 240 units in the federal government is against the constitution and democratic values, complained fringe parties including Federal Socialist Forum Nepal (FSFN) and Rastriya Janata Party Nepal (RJPN) as they criticized the plan of the ruling Nepali Congress and CPN (Maoist Center) to retain old provision in the new federal setup. A quarter of the ruling parties have proposed to hold elections of the federal government in 240 constituencies under the first-past-the-post (FPTP) system. The proposal comes in stark contrast to the provision of the new constitution which envisions 165 electoral constituencies in the parliamentary elections and 330 for provincial assembly elections. In a joint statement, FSFN Chairman Upendra Yadav and Naya Shakti Party Nepal Coordinator Dr Baburam Bhattarai have said the proposal is against the spirit of the new constitution and democratic values. "We are concerned about the reports that political discussions are taking place to maintain the old electoral constituencies even after starting the state restructuring process and holding local level elections. We, at any cost, will not accept such decisions, if taken," reads the statement. Talking separately to Republica, FSFN Chairman Yadav said that the proposal to retain 240 electoral units is a design to finish the historic achievements including federalism. He said that the government should demarcate the boundaries of the provincial and federal governments before announcing the poll date. The Constituency Delineation Commission is yet to demarcate the provincial and federal boundaries. Smaller parties see this as design to hold elections under the previous setup. Likewise, the two leaders urged all to create conducive environment for the upcoming elections by amending the constitution. 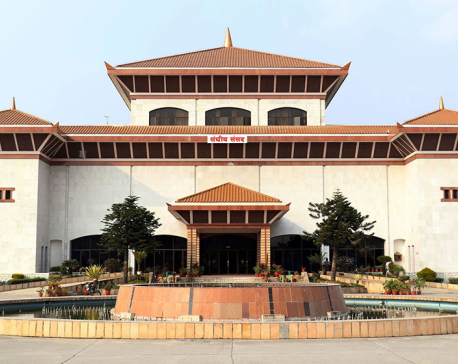 However, the two leaders said that the amendment bill tabled in the parliament needs changes and opined that all the concerned political parties should sit for dialogues immediately. Other smaller parties including Rastriya Prajatantra Party (RPP) and Rastriya Janata Party Nepal (RJPN) have joined FSFN and Naya Shakti in criticizing the plans. Talking to reporters in Birgunj on Sunday, RJPN Chairman Mahantha Thakur said that his party was against the proposal to retain 240 units. “The government should carve 165 electoral constituencies as envisioned by the new constitution. We will strongly oppose the plan to retain 240 constituencies,” said Thakur.